Although groundwater occurs beneath essentially every spot on the Earth, finding usable supplies can be a challenge. Groundwater commonly occurs within earth materials through which water moves very poorly, and thus its extraction may be impossible. Groundwater also may occur very deep in the Earth, making extraction impractical, even if its quality were acceptable for everyday uses. Also, groundwater may contain excessive amounts of salts or minerals, or it may be contaminated. The challenge of locating groundwater supplies is that no one can see directly into the ground. 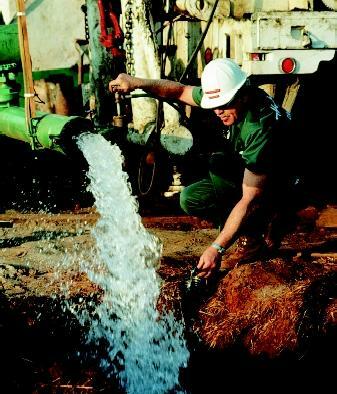 There are a number of methods available for locating groundwater, ranging from straightforward drilling to much more elaborate and complicated geophysical techniques. Even some questionable methods have been called upon to locate groundwater (see sidebar on "water witching"). Methods of exploration commonly employed include: examination of existing well reports; geologic mapping; aerial photographs; radar; electrical conductivity; magnetism; gravity; and seismic methods. Test wells and existing wells provide valuable information about underground geologic formations, including those that would make a productive water-supply source. Here a driller pumps water from a newly constructed well. Examination of records of existing wells in the area of interest provides additional information. That is, previously constructed wells act as test wells. Such records contain information on the geologic materials through which the borings were drilled, the production of the well, the depth, and how the well was constructed or finished. Information from existing wells gives directly applicable information on depths to which wells will need to be drilled, how much water can be expected, and the quality of the water. The information is inexpensive to obtain, yet invaluable to groundwater hydrologists. Aquifers in uniform geologic formations tend to be readily identifiable and predictable. This trait allows geologists and others to predict the occurrence of groundwater by using geologic information alone. By mapping water-bearing geologic formations, both on the surface and where they should occur beneath the surface, reasonable estimates can be made as to where drilling will encounter these same geologic formations. Reliable and inexpensive information often is obtained through this method. In areas where geologic formations are very heterogeneous or where the water occurs in discontinuous and irregular fractures, rather than in a specific formation, test wells may be the only practical way of determining where groundwater occurs in usable quantities. Aerial photographs, side-scan radar, satellite spectral sensing (pictures taken at different wavelengths of light), infrared, and ground-penetrating radar are techniques classified as remote sensing. They give shallow-earth information about plants, geologic materials, and structure. These techniques are particularly good in areas where water flow may be concentrated in fractures or other geologic structures that have surface expression, but are not readily discerned by walking over them. In drier climates, plants often align along water-bearing fractures and appear readily in aerial photographs. Conversely, in wetter climates, the types of plants may differ over water-bearing zones and thus show up distinctly in spectral sensing. Buried or hidden river-channel sediments can become obvious using ground-penetrating radar. Fractures and faults are particularly easy to spot using side-scan radar. Drilling is then directed into the fractures, ancient river channels, fault zones, or layers where water is either known or suspected to be moving. Despite the lack of scientific evidence, the ancient practice of "water witching" (also called dowsing) remains popular. This dowser claims he can locate groundwater supplies and even predict their depth by using only a forked branch. between the physical properties of various earth materials. Gravity meters measure the differences in specific gravity. Seismic techniques measure the speed of seismic waves through earth materials or reflected seismic waves off various geologic surfaces. Electrical conductivity, or resistivity, measures directly these parameters between rods set into the earth. By varying the distance between rods, deeper layers can be explored. Induced electromagnetic fields can be measured as they decay, and by varying the size of the loops that produce such fields, deeper layers are probed. Natural electromagnetic fluxes which pass through the Earth can be measured in a technique known as telluromagnetics. Liquid water, when dispersed through earth materials, becomes quite difficult to distinguish from the surrounding rock by using most geophysical techniques. Further, to find useful quantities of groundwater, one is really searching for rocks and earth materials which will pass water readily through them. For example, clay deposits may contain 40 percent or more water, but will yield water only very poorly to a well; in contrast, a sandy gravel with 20 percent water may produce huge quantities of water. Fortunately, clays and gravels look quite different seismically and electrically. Unfortunately, clayey gravel may look the same as gravelly clay, but the difference in water production can be substantial. Overall, geophysical techniques have tended to be expensive, and with only limited success. Surface geophysical techniques have been found more useful in locating contaminated groundwater plumes and salt water. Here the contrast is fresh water against the saltier, higher-conductivity water. This contrast can dominate over the usually more subtle contrast in earth materials themselves. The greatest use of geophysics has come during well boring and construction. Geophysics often can aid in discerning where water was encountered, and the most productive formations. The "downhole" geophysics techniques can be used very close to the formation; the geologic contrast shows up across formation boundaries; and slight differences in groundwater chemistry prominently show up as a contrast that could not be seen from the surface. In some situations, the formation itself yields the signal. SEE ALSO Aquifer Characteristics ; Fresh Water, Physics and Chemistry of ; Geospatial Technologies ; Groundwater ; Hydrogeologic Mapping ; Wells and Well Drilling . Kearey, Philip, Michael Brooks, and Ian Hill. An Introduction to Geophysical Exploration, 3rd ed. Oxford, U.K.: Blackwell, 2002. Stone, William. J. Hydrogeology in Practice: A Guide to Characterizing Groundwater Systems. Upper Saddle River, NJ: Prentice Hall, 1998. Vogt, Evon Zartman, and Ray Hyman. Water Witching U.S.A., 2nd ed. Chicago, IL: University of Chicago Press, 2000. One of the oldest methods for "finding" (or claiming to find) groundwater is called dowsing or water witching. 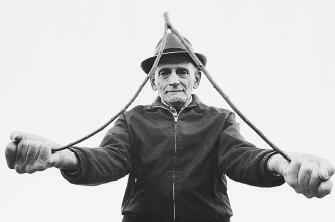 The technique requires the dowser to hold in his hands a forked green willow branch (or a pair of bent brass rods, or any number of other permutations), then walk about, waiting for the device, also called a divining rod, to dip toward the Earth on its own. Many different claims arise as to why the willow branch or rods move, but none has been verified scientifically. Because at essentially every location on Earth, groundwater can be located somewhere beneath the surface, it is no great feat to find water in the ground. However, the task is not just to find water, but to find water that can be removed in usable quantities. Hence, the water dowser's success depends upon finding a place where water can move rather freely through the ground. Some dowsers claim that the very movement of the water sets up electromagnetic currents that interact with the dowser and the divining rod to make the device move. Unfortunately for the dowsers (and their reputations), these same currents and electromagnetic fields are not found by highly sensitive geophysical equipment used by scientists. Of even further consternation for the dowsers, all scientific studies of dowsers and their success rates for finding productive water wells tend to measure about the same success rates, or perhaps lower, as local well drillers simply selecting well locations based on their field experience. * See "Aquifer Characteristics" for a diagram of pump-test results.